THPBlog: FGF US Forest Holdings planning THP on unstable soils near Rio Del and highway 101. FGF US Forest Holdings planning THP on unstable soils near Rio Del and highway 101. THP 1-13-069 HUM (Howe Creek 2013 THP) FGF US Forest Holdings, 415 acres; 100% group selection logging. Howe Creek (HUM: T1N R1W Sec.3, 4; T2N R1W Sec.33, 34). Wet weather operations, moderate erosion hazard, steep slopes up to 65%, landslide terrain, road failure sites, impaired 303.d watershed, coho watershed, 3 spotted owls within 1.3mi, long beard lichen, scattered large trees. Estimated public comment deadline: 10/05/13. This THP is located about 3 miles west of Rio Del and Highway 101 at an elevation of 100 to 1,000 feet. 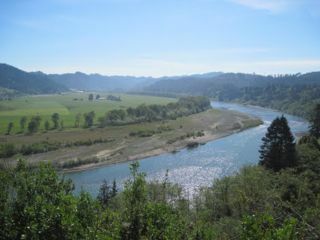 The THP area drains into the Eel River which is listed as impaired for sediment and temperature. FGF US Forest Holdings is planning a tractor and cable logging operation in second growth redwood, Douglas fir, grand fir, and Sitka spruce on steep and unstable slopes. The THP area has 11 road related landslides and road bed failures including an edge slump at a landing, a debris slide/flow related to a road, multiple fill failures, and multiple cut bank failures. There are 49 road drainage work sites including culvert repair and replacement, rocking, dip construction, ditch cleaning and road bed stabilization. FGF US Forest Holdings is planning to long line timber from several places where slopes exceed 50% without flattening before reaching a watercourse, and to use a road system and landing within a streamside area. More information is available on the THP Tracking Center website.